Brent oil prices fell by 2.57% or US$1.82, as prices decreased this week. Oil traded on February 1, 2018 at a price of $69.13 per barrel relative to US$70.95 last week. Brent oil began the year at US$68.07 per barrel. 87 Octane prices increased week over week, by 0.95% (JMD$1.17). 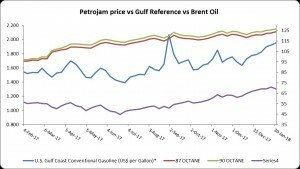 Additionally 90 Octane rose by 0.93% or (JMD$1.17) week over week. 87 Octane and 90 Octane opened the year at J$121.04 and J$123.88 respectively and now trades at J$123.89 and J$126.73 per litre respectively. 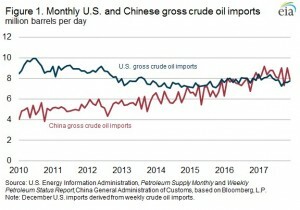 China surpassed the United States in annual gross crude oil imports in 2017 by importing 8.4 million barrels per day (b/d) compared with 7.9 million b/d of U.S. crude oil imports (Figure 1). China had become the world’s largest net importer (imports less exports) of total petroleum and other liquid fuels in 2013. New refinery capacity and strategic inventory stockpiling combined with declining domestic production were the major factors contributing to the recent increase in Chinese crude oil imports. In 2017, an average of 56% of China’s crude oil imports came from countries within the Organization of the Petroleum Exporting Countries (OPEC). The share of Chinese crude oil imports from OPEC countries declined from a peak of 67% in 2012, while Russia and Brazil increased their market share of Chinese imports more than any other country, from 9% to 14% and from 2% to 5%, respectively (Figure 2). Imports from Russia, which passed Saudi Arabia as China’s largest source of foreign crude oil in 2016, totaled 1.2 million b/d in 2017, while Saudi Arabia accounted for 1.0 million b/d. OPEC countries and some non-OPEC countries, including Russia, agreed to reduce crude oil production through the end of 2018, which may have allowed other countries to increase their market share in China in 2017.